I think I might be obsessed with running in Luna Sandals. I either run with no shoes or I am wearing sandals. This would be perfect if I did not live in upstate NY where my aversion to treadmills and addiction to running mean I often find myself running in temperatures well below 0 Fahrenheit or on slush filled roads or both. What is a crazy sandal runner to do? When I first started Winter running, I remember a post snow storm run on slush filled roads in Vibram Five Fingers. I remember it well, because I could not feel my toes for the next day. I figured that there had to be a better way. I did some google searching and found some guy in Colorado that ran in snow with boiled wool tabi socks and Luna sandals. The original blog I found seems to be gone now, but he has this web site: mindyourheadcoop.org. Apparently running barefoot is good for head injuries. He had found a couple of options for tabi socks on etsy. (here is my blog about the discovery http://blog.timesunion.com/running/winter-barefoot-running-and-half-marathons-boston-week-4/8947/). There were two options and I ordered both of them. The cheaper one fell apart pretty quick. However, the custom boiled wool version here: http://mollyspurl.com/running-tabi-socks.html have been awesome. We have gone many places together. Braved blizzards and stepped in frozen streams, all the time keeping my feet toasty warm. Sadly all good things come to an end. The socks have worn a few big holes in them, one in the heel and one in the big toe. Somehow they still manage to keep me warm. However, the sight of bare skin while on top of a snowy mountain has started to worry me. The obvious choice would be to order a new pair, but Molly seems to be taking an extended break (possibly permanent) from making awesome wool tabi socks for crazy sandal runners. I do have a plan to repair those socks, but finding a new source of wool tabi socks would be the best long term strategy, and I like to help others run in the winter with sandals as well. There are some other options like fleece (plastic) tabi socks. I have several pairs of those and they are great for some days but not all days. They do not do well when the temperature too far below 0 F. The are no good at all in salty slush. For dry road runs in “normal runner” winter weather they are great. However, for mountain adventures snow storms and extreme cold, boiled wool is the only way to go. After some searching on etsy, I found these https://www.etsy.com/listing/174232914/new-style-toebiter-tabi-slippers-made-to?ref=pr_shop. Which is actually the same person that was selling the cheaper tabi socks years ago. The new version are custom made to your foot. You send a foot tracing in, and in a pretty short amount of time you get some custom tabi “slippers”. The seem very solid. 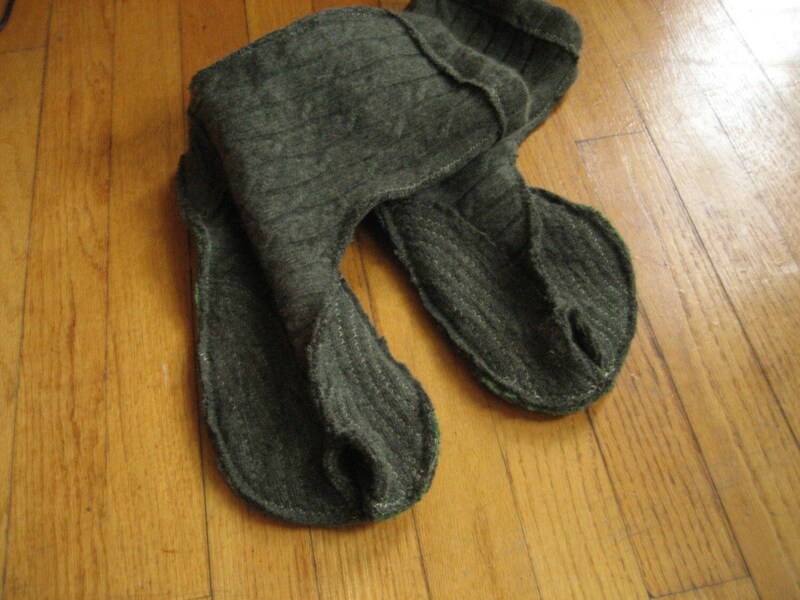 The foot bed is industrial pressed boiled wool, and the upper part is made from old boiled wool sweaters. This gave me some concern at first since the upper part is more breathable than the thick molly’s socks I have grown to love. However, I have been able to put them to the test (since winter is refusing to leave now that it finally got here), and so far they have been fantastic. I have run in deep wet snow, stepped into a frozen stream in the middle of a two hour run, and done a post snow road run with slush and below 10 F temps. I think they could also be used in milder weather without overheating like the molly’s socks do. Although winter is nearly over, I am going to declare victory on the search for a replacement sock, thank you Daphne! Now that we can stay warm, what about slipping and sliding on ice? For roads you can get away with any sandal with some sort of tread. However, for trails with snow and ice, yaktrax work pretty well. But for serious stuff I am now a huge fan of microspikes. I have run up and down mountains with ice, rock and snow and the spikes make me feel like spider man. They fit perfectly over the the original Luna monos, and should work with any thickish Luna sandal. An extra benefit is that they keep the snow from gathering under your toes and creating little snow balls that eventually turn into ice rocks. In what I hope will be the last snow run of the season, I “ran” my favorite trail 15K loop at Moreau Lake. The trail has about 2K of elevation and can be tricky to navigate in the summer. In the snow when the trails are painted white everything looks the same and it can be hard to follow the markers. I was about half way when I encountered some fresh tracks in the snow. Looked to be a man, woman and a dog out for a hike. I picked up the pace as I did not have to keep trying to find the trail. I eventually caught up to the young couple and their dog. I thanked them for making such nice tracks. The woman said, “wow, those are cool running snow shoes”. I explained that they where actually sandals with microspikes and wool socks. She just looked back at me with nothing to say. I thought about asking them where they parked so I would not follow the tracks to the wrong place, but I didn’t. I proceeded to follow the tracks and enjoyed a really nice decent that should not have been there… After half a mile I did not recognize the red trail markers or a nice down hill at that point. I stopped and headed back up. Of course I ran into the couple and the dog again, this time I asked them where they parked and sure enough it was not where I parked. They even apologized for leading me astray, I assured them it was totally my fault. Back to the untracked trail and getting lost every other marker. I eventually made it out in one piece. With Luna Sandals, wool tabi socks, and microspikes, you can run in any winter weather on any surface. Next postSure, I can run 54 miles, but what about 70 miles? SRT 70 2017 race report.